Ronald Lee Martens, 68, of Warsaw, passed away on September 6, 2018, at Great River Medical Center in Burlington, Iowa. Ronald was born on June 29, 1950, in Keokuk, Iowa, the son of Marvin and Marie (Aden) Martens. On October 2, 1989, he was united in marriage to Mary Ann Riney in Keokuk. She survives. A life-long member of Immanuel Lutheran Church, Ronald loved the Lord, his wife Mary Ann, his son Chris and his dog Chloe. He was an avid and skilled card player, often winning hands in Poker, Pitch, Hearts and many other games. 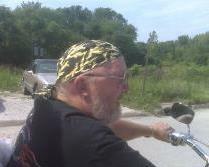 In his free time, he often enjoyed cruising down the road on his Harley-Davidson motorcycles. Ronald proudly served his country in the United States Navy. Ronald is survived by his wife Mary Ann Martens of Warsaw, Illinois; his son Chris (Shanikqua) Martens of Keokuk, Iowa; two brothers: Roger (Judy) Martens of Keokuk, Iowa; and David (Gina) Martens of Colchester, Illinois; his sister Sharon (Raymond) Stotlar of Weaver, Iowa; three sisters-in-law: Flo Martens of Carthage, Illinois; Jane Martens of Carthage, Illinois; and Amy (Jens) Notestein of Stronghurst, Illinois; and many nieces, nephews and cousins. Ronald is preceded in death by his parents; three brothers: Paul, James and Gerald; his nephew Dwayne; his niece Anna Southard; his brother-in-law Steve Riney and his sister-in-law Katherine Martens. Ronald’s life will be celebrated with a funeral service at 6:00 pm on Monday, September 10, 2018, at Printy Funeral Home in Carthage, with a private family burial to follow at a later date. Visitation will be held on Monday from 2 to 6 pm, with family meeting friends from 4 to 6 pm at the funeral home. Memorials may be directed to an organization or charity of the donor’s choice.